I have seen people queuing up for croissants and baguettes outside bakeries on a weekend morning, or waiting for breakfast at cafes after walking their dogs or heading to yoga classes with a lurid pink mat under their arms, but I’ve never spotted people huddling outside a bookstore, checking their watch, waiting for it to open its doors. These people are my idols, my brothers (or sisters) in arms. I could have been any one of them or will be when my love for books trumps my desire to sleep-in on weekend morning. But today I am here with a different motive. 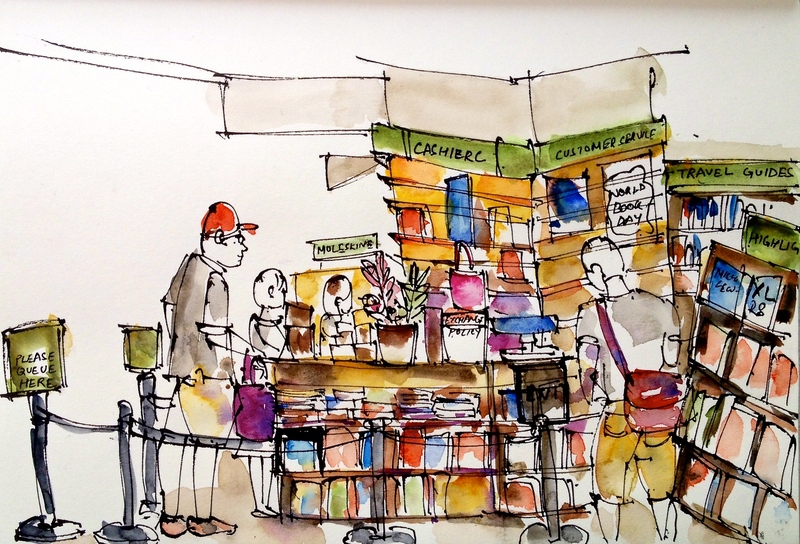 Urban Sketchers Singapore have been allowed to invade the 43,000 sq feet space of Kinokuniya’s flagship store at Ngee Ann City for 3 hours. Why the privilege? Because the store is moving out and when it does, our sketches will serve as sentimental memorabilia. Now before you start brooding and beating your chest in agony, Kino is not vamoosing for good. It is just moving to the floor above, which – here comes the caveat – will be a smaller space. So if anything, you should be worried about the possible downsizing of your favourite section. As for me, I am rapidly using my Kino gift cards to buy more books to propitiate the mighty book goddess, praying that my favourite Art and Design section remains forever bountiful. Add to that the travel literatures and also the cookbooks. And the classics. The books were calling my name, especially those from the ‘art & design’ section, right behind me. It was very hard to concentrate. In the age of small screens, it is reassuring to see people buy the real thing. 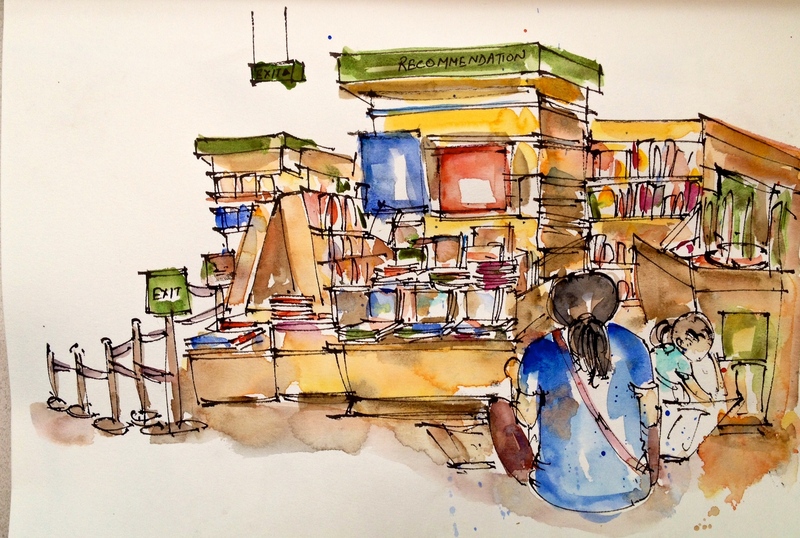 Thumbs up for this mother (also an urban sketcher) who brought her munchkin to a bookshop early morning. Ignoring the resounding book pleas and sketching more shelves. I am a saint! 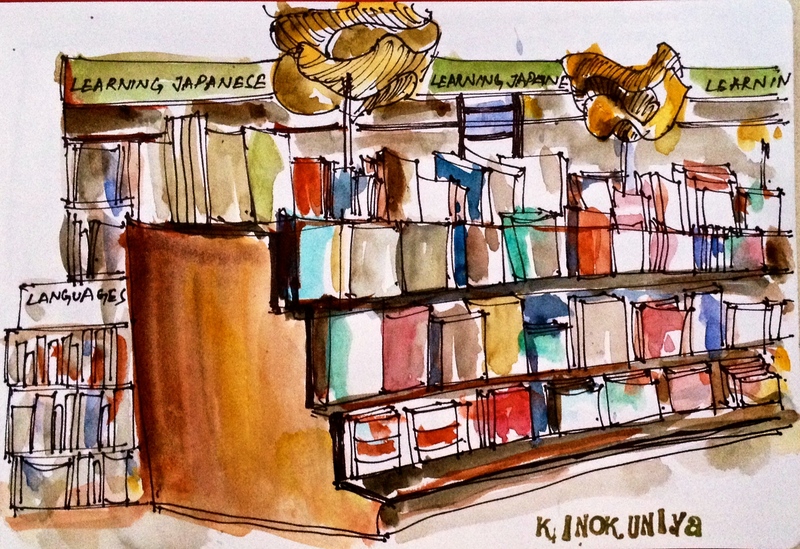 This entry was posted in Daily Vignettes and tagged art, books, bookstore, design, kino, Kinokuniya, Ngee Ann City, Saturday, Singapore, Sketchers Singapore, sketching, Takashimaya shopping Center, travel literature, urban sketchers singapore, urban sketching, weekend morning on May 8, 2014 by Somali Roy.